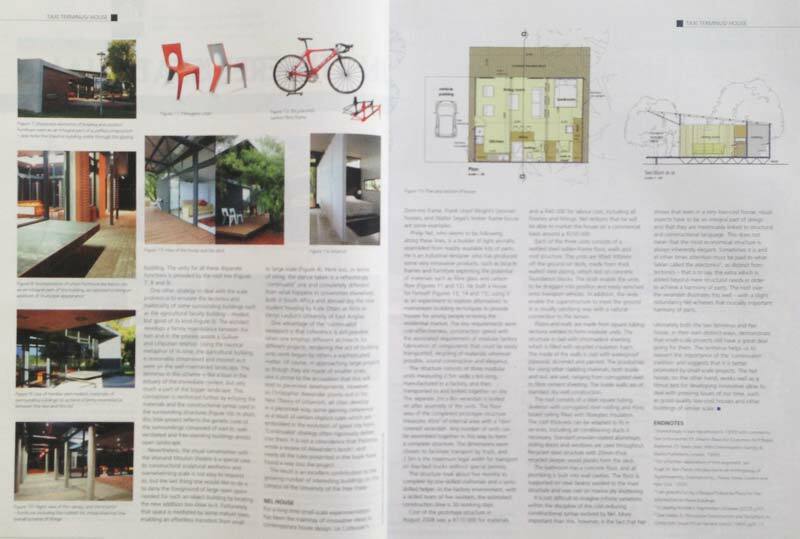 For a long time small-scale experimentation has been the mainstay of innovative ideas in contemporary house design. Dom-ino frame, Frank Lloyd Wright's Usonian houses, and Walter Segal's timber frame house are some examples. Philip nel, who seems to be following along these lines, is a builder of light aircrafts assembled from readily available kits of parts. He is an industrial designer who has produced some very innovative products, such as bicycle frames and furniture exploiting the potential of materials such as fibre glass and carbon fibre. He built a house for himself, using it as an experiment to explore alternatives to mainstream building techniques to provide houses for young people entering the residential market. The key requirements were cost-effectiveness, construction speed with the associated requirement of modular factory fabrication of components that could be easily transported, recycling of materials wherever possible, sound construction and elegance. The structure consists of three modular units measuring 2.5m wide X 6m long, manufactured in a factory, and thaen transported to and bolted together on site. The separate 2m x 8m varanday is bolted on after assembly of the units. The floor area of the completed prototype structure measures 45m2 of internal area with a 16m2 covered verandah. Any number of units can be assembled together in this way to form a complete structure. The dimensions were chosen to facilitate transport by truck, and 2.5m is the maximum legal width for transport on low-bed trucks without special permits. The structure took about five month to complete by one skilled craftsman and a semi-skilled helper. In the factory environment, with a skilled team of five workers, the estimated construction time is 30 working days. 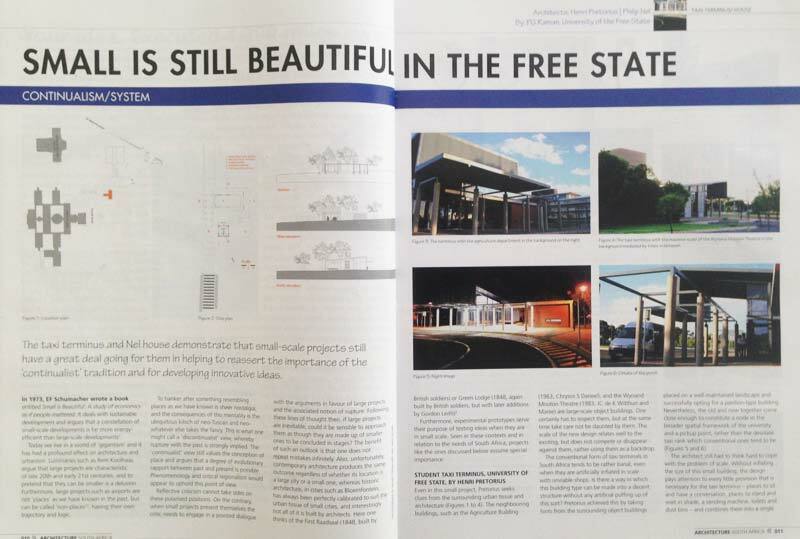 Cost of the prototype structure in August 2008 was +- R110 000 for materials and +- R40 000 for labour cost, including all finishes and fittings. Nel reckons that he will be able to market the house on a commercial basis around +-R250 000. Each of the three units consists of a welded steel ladder-frame floor, walls and roof structure. The units are lifted 300mm off the ground on skids, made from thick walled steel piping, which rest on concrete foundation blocks. The skids enable the units to be dragged into position and easily winched onto transport vehicles. In addition, the skids enable the superstructure to meet the ground in a visually satisfying way with a natural connection to the terrain. Floors and walls are made from square tubing sections welded to form modular units. The structure is clad with chromadeck sheeting which is filled with recycled insulation foam. The inside of the walls is clad with waterproof plywood, skimmed and painted. The possibilities for using other cladding materials, both inside and out, are vast, ranging from corrugated steel to fibre cement sheeting. The inside walls are of standard dry-wall construction. The roof consists of a steel square tubing skeleton with corrugated steel roofing and rhino board ceiling filled with fibreglass insulation. The roof thickness can be adapted to fit in services, including air conditioning ducts if necessary. Standard powder-coated aluminium sliding doors and windows are used throughout. Recycled steel structure with 20mm-thick recycled sleeper wood planks form the deck. The bathroom has a concrete floor, and all plumbing is built into wall cavities. The floor is supported on steel beams welded to the main structure and was cast on marine ply shuttering. It is not difficult to imagine infinite variations within the discipline of the cost-reducing constructional syntax evolved by Nel. More important than this, however, is the fact that Nel shows that even in a very low-cost house, visual aspects have to be an integral part of design and that they are inextricably linked to structural and constuctural language. This does not mean that the most economical structure is always inherently elegant. Sometimes it is and at other times attention must be paid to what Sekler called the atectonics, as distinct from tectonics – that is to say, the extra which is added beyond mere structural needs in order to achieve a harmony of parts. The roof over the verandah illustrates this well – with a slight redundancy Nel achieves that crucially important harmony of parts.